Notice that the area is round and pink. It has a raised rough scaly border. The ring slowly increases in size. It is usually slightly itchy. 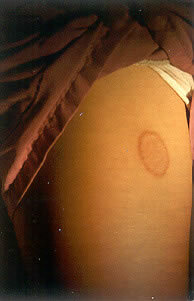 Patch of ringworm on upper thigh that has been present for three weeks.